Yesterday I opened th refrigerator and I saw apples. Immediately I new that for dessert we were going to have apple pie or apple cake. I was not sure yet. Finally I ended up with an apple cake. 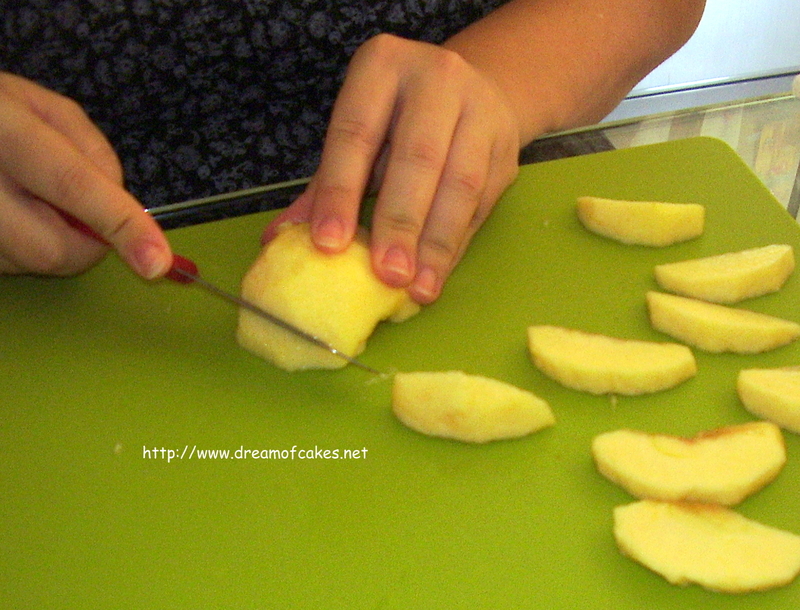 1) Apples weighted a total of 1kg (peeled). 2) You can use less cinnamon. Do not use more; it will make your cake bitter. 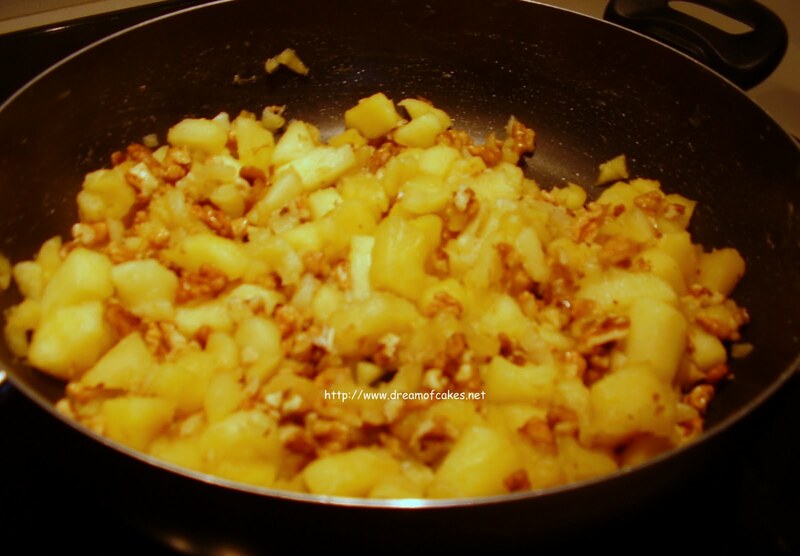 3) You can use the same amount of peeled almonds instead of walnuts. 4) You can replace Cypriot zivania* with Greek Ouzo. 5) If you don’t use a silicon pan, you have to spray the sides of the pan with a non stick spray. Do not use oil or flour. Do not spay the bottom of the pan. 6) Before you cut the cake allow it to cool completely. 1) Peel all apples, remove the seeds and put them on a bowl of cold water. Add the juice of half a lemon to the water. 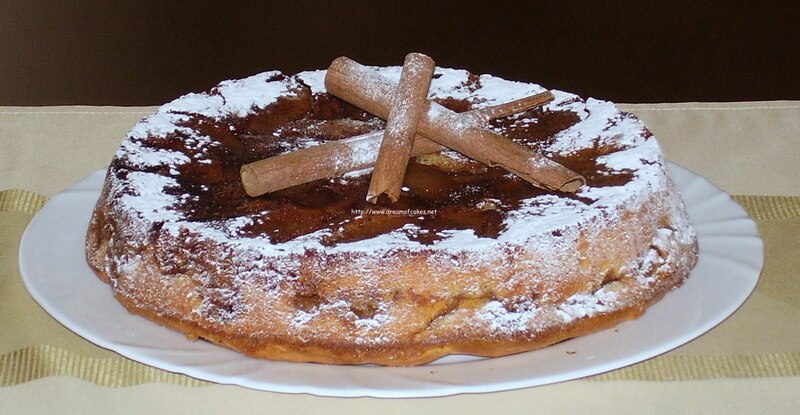 1) In a round silicon round pan (25cm diameter) sprinkle half of the sugar and 1 tablespoon of cinnamon powder. 2) Then cut the apples into thin slices. 3) Place the apple slices on top of the sugar and the cinnamon clockwise. 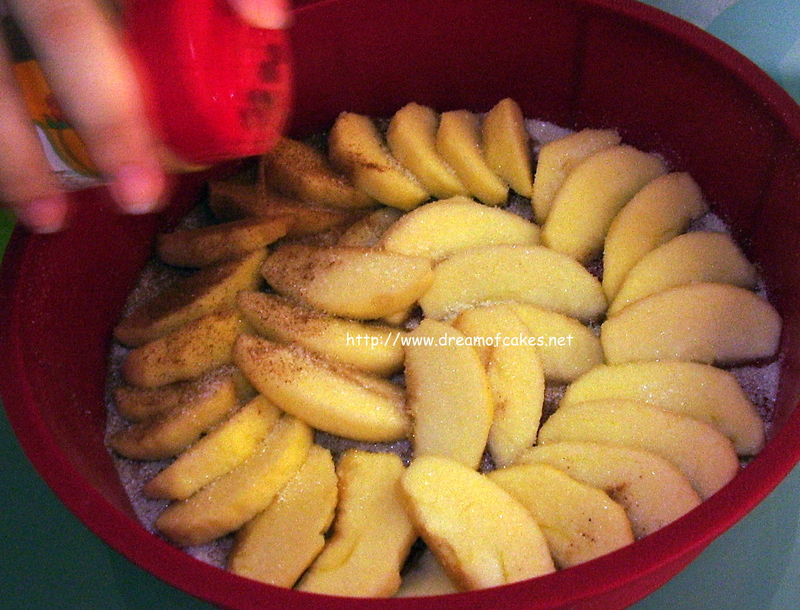 4) Sprinkle the rest of the sugar and cinnamon on top of the apples and set aside. 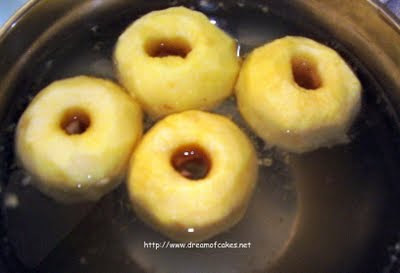 1) Cut 1 apple into very small squares and the rest into bigger squares (1cm x 1cm). 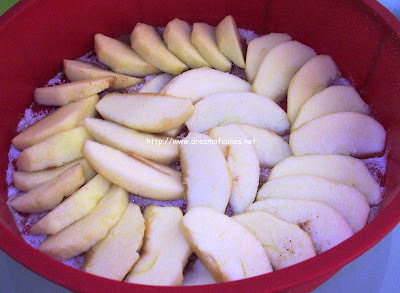 2) In a non stick pan put the apples with the sugar and cook in high heat for approximately 10’ minutes. Stir occasionally. If you see that there is now liquid left before the 10’ minutes elapsed remove from fire. 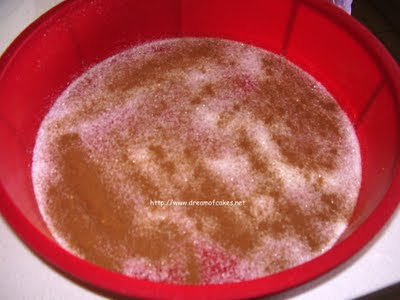 3) Add zivania and stir. Bring back to fire until the alcohol evaporates. Then add the walnuts. 4) Stir all ingredients and remove from fire. Allow to cool. Do not add cinnamon yet. 1) Beat butter with sugar until light and fluffy. 2) Add one by one the eggs. Each egg has to be well mixed with the butter mixture before you add the next one. 3) Sift flour and add the vanilla sachet. Add half of the flour to the butter mixture. Then add half of the milk. Do not over mix. 1) On top of the base poor half of the cake dough. 2) Then, on top of the dough, lay the apple filling; add cinnamon (look on filling ingredients). 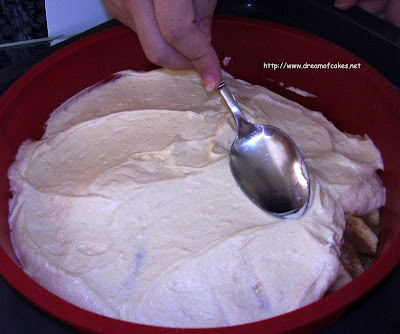 3) Finally add the second half of the cake dough. 4) Bake in a preheated oven, at 170ºC, for 30’ minutes. Then reduce oven temperature to 160ºC and continue baking for another 35’ minutes. 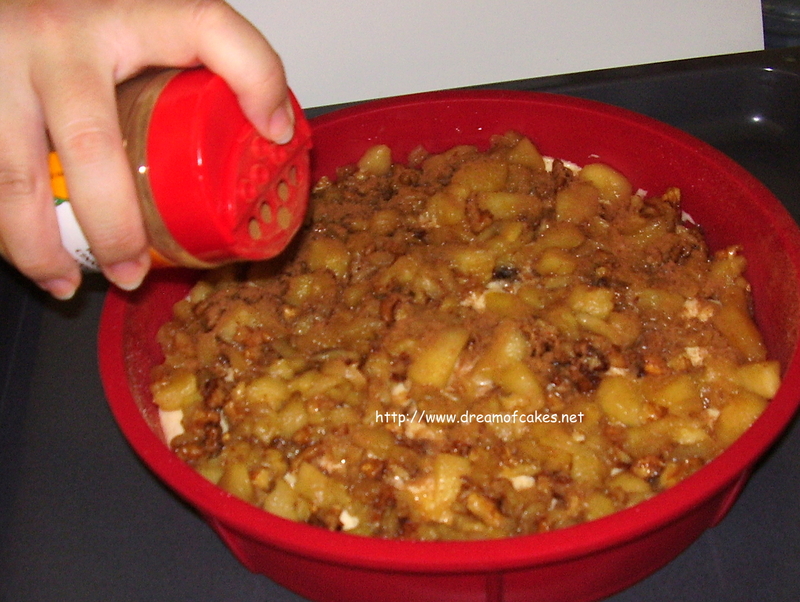 5) Allow to cool for 10’ minutes before you remove the apple cake from the pan to a wire rack to cool. 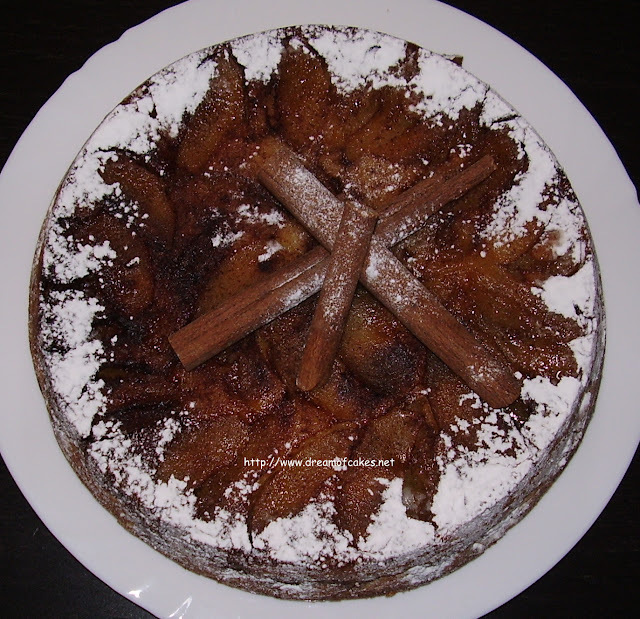 6) Serve with vanilla ice cream, icing sugar or plain. 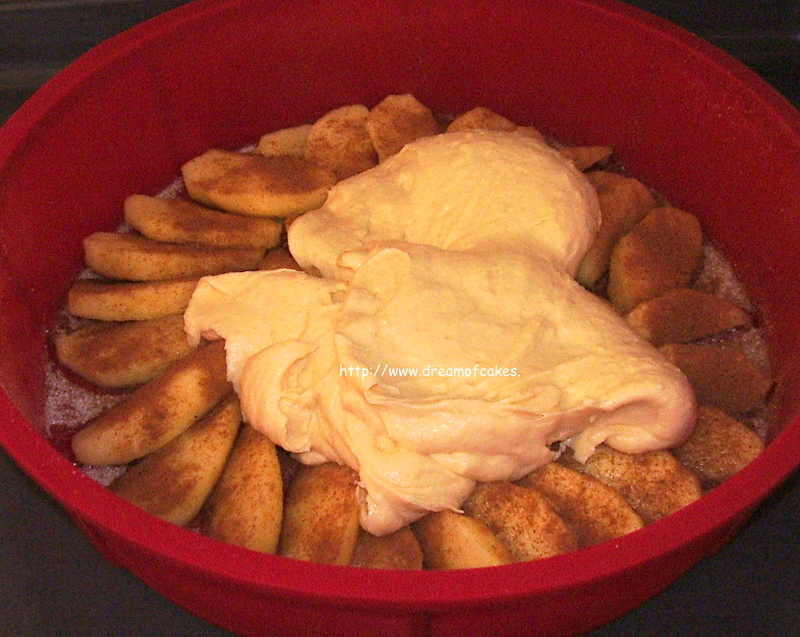 Now is the time to add cinnamon on top of the filling. Simply Delicious!! Trust me on this...!!! 1) In a round silicon pan (25cm diameter) sprinkle half of the sugar and 1 tablespoon of cinnamon powder. 5) If you don’t use a silicon pan, you have to spray it first with a non stick spray. Do not use oil or flour. This recipe sounds and looks very delicious. I really like how your blog is so detailed. Not being a baker myself I feel as if I could handle this well because of your precise recipe and instructions. Great job :-) I know where to look next time I want to make a dessert. O-M-G I can almost smell the cake and I'm ready to eat it ! I'm definitely saving this recipe, as I'm gonna try it soon. I don't really like the silicon pan, but I may use it especially for this cake. 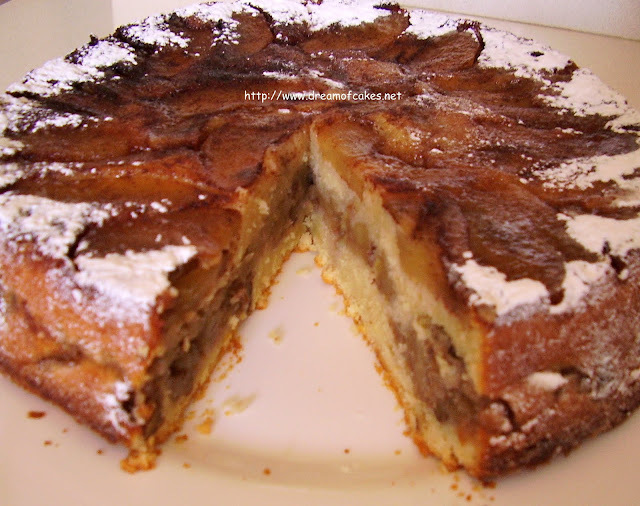 This is awesome, I like all that apple inside and it has very little cake-yum! Also that final picture looks elegant, nicely decorated. Great post! Oh I can see why this was sinful! It's awesome... and super pretty! Oh my goodness, this looks good!! It's so pretty and I like how you layered it! I love the looks of this cake and would like to make it this next week...the only thing that didn't translate it my brain :-) was "a vanilla sachet". What exactly IS that? I googled it and got a variety of answers from measurements to descriptions of vanilla sugar. Could you clarify please? Thanks...it looks so delicious!! Ooohhh love how you layered all the different cuts of apples. Will definitely try this in apple season. This looks amazing! I love this time of year...except I'm allergic to cinnamon now, so it's hard to miss out on all the good treats! Beautiful cake! I'm not a big fan of apples, but your cake looks so good!!! Thanks for sharing! Definitely sinful and definitely a cake I must bake! Wow this sounds fantastic - almost Christmassy! delicioso!! looks so yummyy!! thanks for the good idea! I can't wait to give this a try! Beautiful. Oh boy, this looks beyond delicious!! My son, Daniel, would love this so much. It was eaten already my friend :-)!! 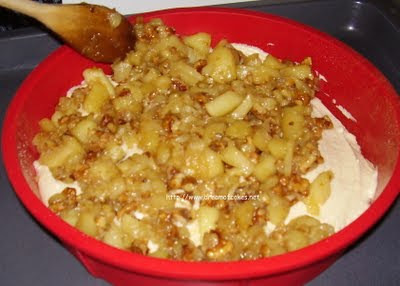 This looks wonderful...just in time for the apples I have from the tree next store...this just looks amazing. It's good the madness is on or else I would have missed it. Looks so delicious and you gave such step by step photos. Oh My! It looks divine, wish I could have a slice. Wow this cake is beautiful! It is such a wonderful fall treat! I need to run out and get apples so I can make this! Thank you SOOOOOOOOOOOO much for sharing! I echo the sentiments of the other foodies who've commented - WOW! This looks so amazing! You are a true talent! Looks beautiful and so yummy! Buzzed! Stunning cake!! Definitely well worth the effort! Love the title to this :-). Don't you just love the aroma of this as it cooks . Yum..This looks so yummy. I really cant wait to try! Oh my... I'm getting a craving for apples. 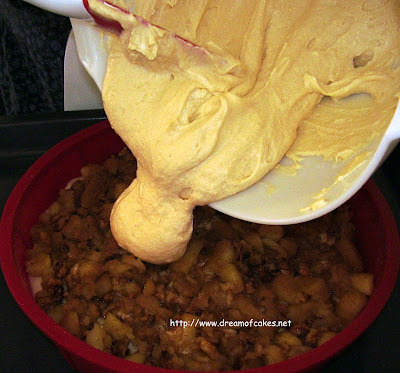 Must... make... apple... cake! I am sure your house is filled with the nice aroma when the cake is baking. 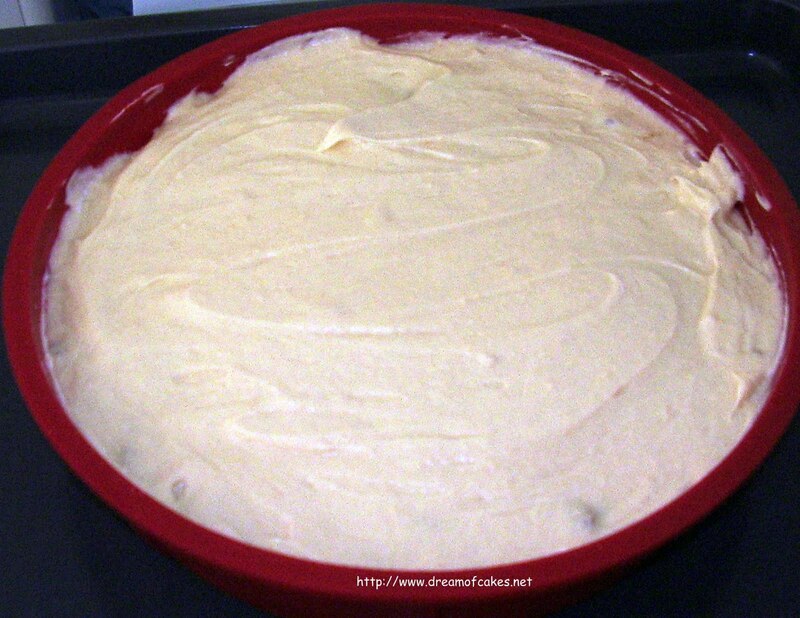 I make this cake quite often with a recipe given to me by a friend. I am sure your cake taste delicious. Ohmygoodness, that one is definitely sinful haha.. BUT GEEZ this would be so yummy, I know so! Thanks so much for sharing, sweetie. This cake is sinful! It looks so delicious and flavorful! Oh my yum! I'm so glad fall is here! Oh my god Efty , your cake is just heavenly ,absolutely divine , mine is nothing compared to this , I will def give this one a try and will surely let you know , gotta buy me some apples :D .
You had me at sinful!! 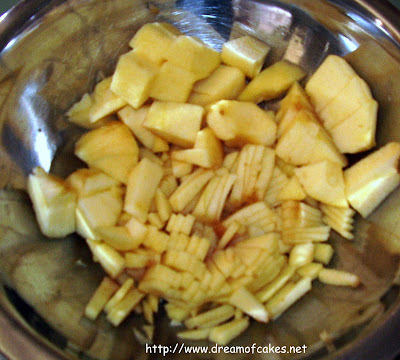 Look at all those delicious layers of apples! I love apple everything, probably because my Mommom always made apple everything, apple pie, apple cake, apple loaf...I love it. This sounds absolutely amazing! Hi Blair, yes I meant cups. I updated the post. Thank you! !